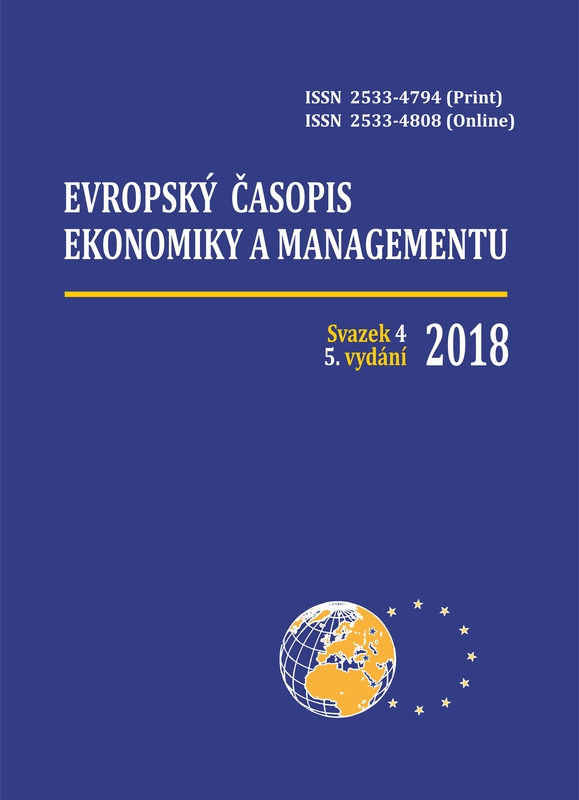 Scientific journal “Evropský časopis ekonomiky a managementu” (“European Journal of Economics and Management”) invites Sc.Ds, Ph.Ds, young scientists (postgraduates, doctorates and master degree seekers), specializing in various branches of economics and management to cooperate for publication of scientific articles. Contributions to the «European Journal of Economics and Management» shall be articles of original research or analysis papers. «European Journal of Economics and Management» is a refereed journal. Submissions are subject to academic peer-review. Every submitted manuscript receives at least two professional reviews, at least one of which is a double-blind review. Submissions can be made at any time to the following e-mail address: [email protected] An initial consideration of the submission by the editorial team typically takes between one and three months. If the submission is accepted for peer-review, this process typically takes another one to three months. If the article is accepted for publication after peer-review, the final editorial preparatory work typically takes another one to three months. Unless otherwise specified, copyright is shared by both the contributor and the «European Journal of Economics and Management». «European Journal of Economics and Management» has a strict policy against any forms of plagiarism, including self-plagiarism. Any quotation – even a short one – from a separate source shall be followed by the required corresponding reference. Any literal quotation – i.e. word-by-word – shall be provided in quotation marks or separated into a distinct paragraph as a block quotation. Authors are responsible for observing the laws of copyright when quoting or reproducing any and all borrowed material. Page Limit is 10 – 30 pages. The language of articles is Czech, Ukrainian, English. The edition provides additional services of articles translation on foreign (English, Czech) languages. For an article in any language, the following is required in English: an abstract (700-900 characters), a title of the article and complete data of an author – full first, middle and last name, academic title, academic degree, position, and place of employment. Footnotes are allowed, no endnotes. Bibliography should be arranged in accordance with the agreements of the American Psychological Association (APA). Illustrations to articles (graphics, images and diagrams) should be submitted in the TIFF or PDF format (each image in a separate file). While preparing illustrations authors should take into account that colour printing is not available in the Journal. The editorial board do not register and do not review for publication manuscripts that do not comply with the aforementioned requirements. When arranging bibliographic descriptions of sources and literature it is necessary to consider regular and cursive (Italic) text fonts, as well as the sequence of elements in a reference. Footnotes should be provided in the original language of a source to which you refer, that is, they are not translated or transliterated. Quotes within the article should be provided in the language of the article. – publisher’s imprint information in English. In References, when indicating a city of publication both in English and Cyrillic sources, the name of the city should be given in English, while the name of the publishing house should be transliterated. For automatic transliteration of Cyrillic sources, you can use the following resources http://www.translit.ru – for sources in Russian; and http://www.slovnyk.ua/services/translit.php — for sources in Ukrainian. When arranging references on website materials, a reference should include author’s name, title of the page, name of the site (typed in Italic font), site address <URL>, marked by <> symbols, and, if possible, the date when this page was last browsed (in round brackets). The month is provided in the language of the article. For your convenience, below you can see examples of arranging bibliographic descriptions of sources and literature organized by source type; each one is given in two formats sequentially: the first one is the footnote example; the second is the example of arranging the same source in References. Barney, J.B. (1996). Gaining and sustaining competitive advantage. Boston: Addison-Wesley, 140. Хабермас, Ю. (2003). Философский дискурс о модерне. Москва: Весь мир. Habermas, Ju. (2003). Filosofskij diskurs o moderne [Philosophical Discourse on Modernity]. Moscow: Ves’ mir. [in Russian]. Belt, B., Brummer, C., Gorfine,D. (2012). Crowdfunding: Maximizing the promise and minimizing the peril. Washington, DC: Milken Institute, 5. Пашута, М.Т., Шкільнюк, О.М. (2005). Інновації: понятійно-теормінологічний апарат, економічна сутність та шляхи стимулювання: навчальний посібник. Київ: Центр навчальної літератури. Pashuta, M.T., Shkilnyuk, O.M. (2005). Innovaciyi: ponyatijno-terminologichnj aparat, ekonomichna sutnist ta shlyaxy stymulyuvannya: navchanyj posibnyk [Innovations: the conceptual and therminological apparatus, the economic essence and ways of stimulation: the manual]. Kyiv: Centr navchalnoyi literatury. [in Ukrainian]. Andries, A.M. (2015). Nexus between concentration and fragility across EU banking systems. Procedia Economics and Finance, 32, 1140 – 1147. Andries, A.M. (2015). Nexus between concentration and fragility across EU banking systems. Procedia Economics and Finance, no. 32, 1140 – 1147. [in English]. Musilová, K. (2017). Mozhnosti aplikace konceptu postmaterialnigo shtepeni na substatnih urovnih. [The Possibilities and Limits of Applying the Concept of Postmaterial Cleavage on Sub-State Levels]. Central European Political Studies Review, 19(1), 55-75. doi:http://dx.doi.org/10.5817/CEPSR.2017.1.55 [in Czech]. Андрощук, Г.О. (2014). Інтелектуальна власність в наукоємних виробництвах і оборонній сфері в системі національної безпеки. Наука та наукознавство, 4, 90-100. Androshchuk, H.O. (2014) Intelektual’na vlasnist’ v naukoyemnykh vyrobnytstvakh i oboronniy sferi v systemi natsional’noyi bezpeky [Intellectual property in knowledge based industries and the defense sector in the system of national security]. Nauka ta naukoznavstvo. [Science and Research], no. 4, 90-100 [in Ukrainian]. Dur, A., Baccini, L., Elsig, M. (2014). The Design of International Trade Agreements: Introducing a New Database. Review of International Organizations, vol.9(3), 353-375. Dur, A., Baccini, L., Elsig, M. (2014). The Design of International Trade Agreements: Introducing a New Database. Review of International Organizations, vol.9(3), 353-375. [in English]. Башлик, Д.О. (2015). Історичні передумови для сучасного економічного суперництва Японії та Китаю. Політологія, філософія, соціологія: контури міждисциплінарного перетину: матеріали ІІІ Міжнародної науково-практичної конференції (м. Одеса, 15-16 жовтня 2015 р. ), 89-91. Bashlik, D.O. (2015). Іstorichnі peredumovi dlya suchasnogo ekonomіchnogo supernictva Yaponіy ta Kitayu. [Historical prerequisites for the current economic rivalry of Japan and China]. Polіtologіya, fіlosofіya, socіologіya: konturi mіzhdisciplіnarnogo peretinu: materіali ІІІ Mіzhnarodnoї naukovo-praktichnoї konferencії (m. Odesa, 15-16 zhovtnya 2015 r.). [Political science, philosophy, sociology: contours of the interdisciplinary section: materials of the 3rd International Scientific and Practical Conference (Odesa, October 15-16, 2015)], 89-91. [in Ukrainian]. Давиденко, М.Л., Сірик, О.М. (2013) Сучасні проблемні питання тлумачення статті 152 Кримінального кодексу України. Правове життя сучасної України: матеріали Міжнародної наукової конференції професорсько-викладацького та аспірантського складу (м. Одеса, 16-17 травня 2013 р. ), 2, 284-285. Davidenko, M.L., Sіrik, O.M. (2013) Suchasnі problemnі pitannya tlumachennya stattі 152 Krimіnal’nogo kodeksu Ukraini. [Current issues of interpretation of Article 152 of the Criminal Code of Ukraine]. Pravove zhittya suchasnoї Ukraїni: materіali Mіzhnarodnoї naukovoї konferencії profesorsko-vikladackogo ta aspіrantskogo skladu (m. Odesa, 16-17 travnya 2013 r.) [The Legal Life of Modern Ukraine: Materials of the International Scientific Conference of the Teaching and Postgraduate Students (Odessa, May 16-17, 2013)], 2, 284-285. [in Ukrainian]. Nozick, R. Anarchy, State and Utopia. Wikipedia. <http://en.wikipedia.org/wiki/Anarchy,_State,_and_Utopia#Equality.2C_Envy.2C_Exploitation.2C_Etc> (2017, July, 01) [in English]. Феєр, О. (2016). Модернізація як економічна категорія. Науковий вісник Мукачівського державного університету, 1(5), 70-74. <http://www.msu.edu.ua/visn/wp-content/uploads/2016/05/1-5-1-2016-11.pdf> (2017, липень, 03). Feyer, O. (2016). Modernizaciya yak ekonomichna kategoriya [Modernization as an economic category]. Naukovy`j visny`k Mukachivs`kogo derzhavnogo universy`tetu [Scientific herald of Mukachevo State University], 1(5), 70-74. <http://www.msu.edu.ua/visn/wp-content/uploads/2016/05/1-5-1-2016-11.pdf> (2017, July, 03). [in Ukrainian]. Horn, H., Mavroidis, Р.С., Sapir, А. (2009). Beyond the WTO? An anatomy of AU and US preferential trade agreements. Bruegel. <http://bruegel.org/wp-content/uploads/imported/publications/bp_trade_jan09.pdf> (2017, July, 25). Horn, H., Mavroidis, Р.С., Sapir, А. (2009). Beyond the WTO? An anatomy of AU and US preferential trade agreements. Bruegel. <http://bruegel.org/wp-content/uploads/imported/publications/bp_trade_jan09.pdf> (2017, July, 25). [in English]. Амосов, О.Ю., Гавкалова, Н.Л. (2011). Модернізація в Україні: шлях в майбутнє. Стратегія розвитку України. Економіка, соціологія, право. Т.1, 4, 16-21. <http://ecobio.nau.edu.ua/index.php/SR/article/view/4383/4515> (2017, липень, 05). Amosov, O.Yu., Gavkalova, N.L. (2011). Modernizaciya v Ukrayini: shlyax v majbutnye [Modernization in Ukraine: the way to the future]. Strategiya rozvy`tku Ukrayiny. Ekonomika, sociologiya, pravo [Strategy of development of Ukraine. Economics, sociology, law]. T.1, 4, 16-21. <http://ecobio.nau.edu.ua/index.php/SR/article/view/4383/4515> [in Ukrainian]. Definition of modernization. Merriam-Webster, Inc. Dictionary. <http://www.merriam-webster.com/dictionary/ modernization> (03 березня 2017). Definition of modernization. Merriam-Webster, Inc. Dictionary. <http://www.merriam-webster.com/dictionary/ modernization> (03 березня 2017). [in English]. (2017, March, 03). Закон про виконавче провадження cт. 24. 1999 (Верховна Рада України). Офіційний вісник України, 19, 194. Zakon pro vykonavche provadzhennya 1999 (Verkhovna Rada Ukrajiny). [Law on Enforcement 1999 (Verkhovna Rada of Ukraine)]. Oficijnyj visnik Ukrajiny [Official Bulletin of Ukraine], 19, 194. [in Ukrainian]. Проект Закону про виставкову діяльність в Україні 2005 (Верховна Рада України). Офіційний сайт Верховної Ради України. <http://w1.c1.rada.gov.ua/pls/zweb2/webproc4_1?pf3511=25190> (01 грудня 2005). Рекомендация о развитии людских ресурсов: образование, подготовка кадров и непрерывное обучение 2004 (Международная организация труда). Офіційний сайт Верховної Ради України. <http://zakon4.rada.gov.ua/laws/show/993_532> (21 листопада 2013). Угода про співробітництво в галузі авіаційного пошуку і рятування 2012 (Кабінет Міністрів України та Уряд Російської Федерації) Офіційний вісник України, 29, 130. Ugoda pro spivrobitnytstvo v galuzi aviatsiynogo poshuku i ryatuvannya 2012 (Kabinet Ministriv Ukrayiny ta Uryad Rosiys’koyi Federatsiyi) [Agreement on cooperation in the field of aviation search and rescue 2012 (Cabinet of Ministers of Ukraine and Government of the Russian Federation)]. Oficijnyj visnik Ukrajiny [Official Bulletin of Ukraine], 29, 130. [in Ukrainian]. The Vienna Convention on Consular Relations. Germany v. USA. (Request for the Indication of Provisional Measures: Order) General List No 104  ICJ 1. The Vienna Convention on Consular Relations. Germany v. USA. (Request for the Indication of Provisional Measures: Order) General List No 104  ICJ 1. [in English]. Delta v. France (Article 50), 30 January 1990, § 38, Series A no. 191‑A. Delta v. France (Article 50), 30 January 1990, § 38, Series A no. 191‑A. [in English]. Campbell v. Ireland, no. 45678/98, § 24, ECHR 1999-II. [in English]. Постановление по делу № 16-П  КС РФ. <http://www.consultant.ru/document/cons_doc_LAW_148711/> (21 июня 2016). Postanovlenie po delu № 16-P  KS RF. [Resolution in the case No. 16-P  of the Constitutional Court of the Russian Federation]. <http://www.consultant.ru/document/cons_doc_LAW_148711/> [in Russian] (2016, June 21).